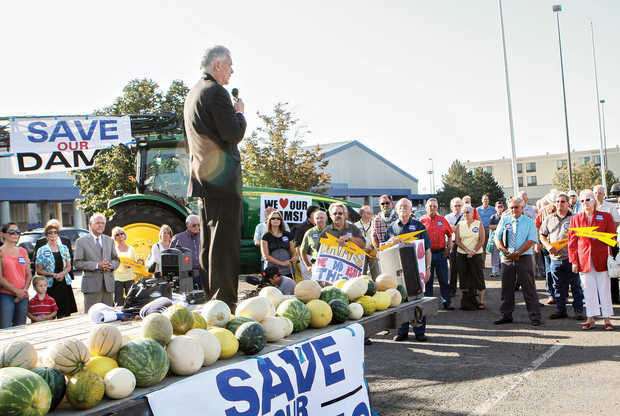 Othello farmer Mark Booker handed out yellow signs shaped like lightning bolts marked "Save Our Dams" at a rally Wednesday in Pasco before a field hearing of the federal House Natural Resources Committee. The signs were 20 years old, recycled by Booker from an earlier fight to preserve dams. Forty percent of the world's food supply comes from irrigated farm land made possible with dams, he said. "Without irrigation, we would have hungry people everywhere," Booker said. In recent years, supporters of Northwest hydropower and dams have been on the offensive, U.S. Rep. Doc Hastings, R-Wash., told a crowd of about 100 who gathered for the rally. An oversized U.S. flag flew overhead, and the flatbed truck for speakers to stand on was piled with freshly picked Mid-Columbia melons. Every year, legislation is introduced to breach dams or study breaching, Hastings said. He has introduced legislation intended to take back the offensive on saving dams, he said, describing it as a "common sense" approach to protecting hydropower. "If you want to sue the federal government, don't expect a handout," said Rep. Tom McClintock, R-Calif., who attended the hearing with Hastings as the chairman of the Water and Power Subcommittee. It would require that the Bonneville Power Administration and other agencies report costs related to federal fish and wildlife acts to power customers monthly. The bill also would require Congress to authorize activities in a March memo from Energy Secretary Steven Chu to BPA and other hydropower marketing administrations concerning alternative energy production that likely would raise Northwest power rates. While dam supporters rallied before the hearing, the Save Our Wild Salmon organization held a news conference nearby criticizing the legislation, calling it heavy handed and saying it would restrict innovation in clean energy and constrain the ability of federal agencies and private entities to work together to find solutions. The bill addresses Hastings' pet peeves in the Mid-Columbia, but the legislation would have nationwide impacts, said Glen Spain, Northwest regional director of the Pacific Coast Federation of Fishermen's Associations. It puts jobs at risk for commercial fishers, he said. But at the field hearing at the TRAC center, Hastings and McClintock heard from Northwest farming, utility and union leaders about the benefits of dams and hydropower and the need to protect them. The crowd attending the hearing overflowed the hearing room where 120 chairs were set up, leaving some people watching a video screen outside. "Back in 2000, the campaign to tear out the Snake River dams was waged as a full public debate, but the dam removal extremists lost that battle," Hastings said at the hearing. "They lost because the people of the Pacific Northwest know that removal of these dams would be an extreme action that would cost jobs, increase power rates and harm the region's economy." Since then, dam-removal advocates have poured their money into lawsuits, he said. That has included Spain's organization, which has participated in several lawsuits, Hastings said. Not all dams are worth saving, and taking some down makes economic sense, Spain said. "Which Snake River dams are obsolete?" asked Hastings, saying that was the focus of one of the lawsuits. Each dam has to be evaluated individually, Spain said. "When you are so evasive, it ruins whatever credibility you brought in here, which in my mind is not much," said McClintock, after pressing Spain on what new hydro projects he supported. Some people have forgotten that before the era of dam construction, an endless cycle of withering droughts and violent floods plagued watersheds, he said. "It is hard to believe that we have to defend the economic and environmental benefits of the dams. But we do," Jim Sanders, general manager of the Benton Public Utility District, said at the hearing. When the idea of breaching dams took hold 12 years ago, there were little, if any, variable resources such as wind on the Northwest electric grid. Now, BPA expects to have 5,000 megawatts connected by next year. But the wind blows enough to generate electricity only a third of the time, and generally the air is calm during the hottest and coldest times of the year, when the most electricity is needed, he said. That makes hydropower more necessary than ever to back up wind generation megawatt for megawatt and maintain the reliability of the electric system, he said. Jim Yost, the Idaho council member of the Northwest Power and Conservation Council, called wind power a fad, comparing it to Beanie Babies. "What are they good for? Not much. It's the same as wind," he said. Breaching dams would end barge navigation, putting up to 700,000 more trucks on the highways and increasing greenhouse gas emissions, said Kara Rowe of the Washington Association of Wheat Growers. After the hearing, Trout Unlimited issued a statement saying that legislation would strip money from it and other nonprofit groups that use federally supported grants for habitat restoration work. Hastings' opponent in the November election, Yakima Democrat Mary Baechler, said voters want congressional leaders to work across the aisle. "This bill appears to single out a category of groups for punishment of past lawsuits," she said. Written comments were collected from members of the public who attended the meeting. Comments also may be submitted through the Natural Resource Committee website at natural resources.house.gov/contact.